Here at Showbie HQ, the end of July and the beginning of August feel like the calm before the back-to-school storm. Teacher and student activity are at their yearly low point, but at the same time, our team is working harder than ever to improve Showbie as much as possible in time for the back to school rush. This year, the result of our efforts is Showbie 2.2 — a big update that’s available in the app store right now, just in time for the new school year! Read on to find out what’s new. The ability to record grades in Showbie was the #1 most requested feature last school year, so we’ve added a fast, flexible, and simple gradebook to Showbie Pro! You can add a grade from almost anywhere in Showbie, whether you’re viewing an assignment folder, providing feedback on a PDF or image, reviewing an ePub file, or viewing a student-submitted link. 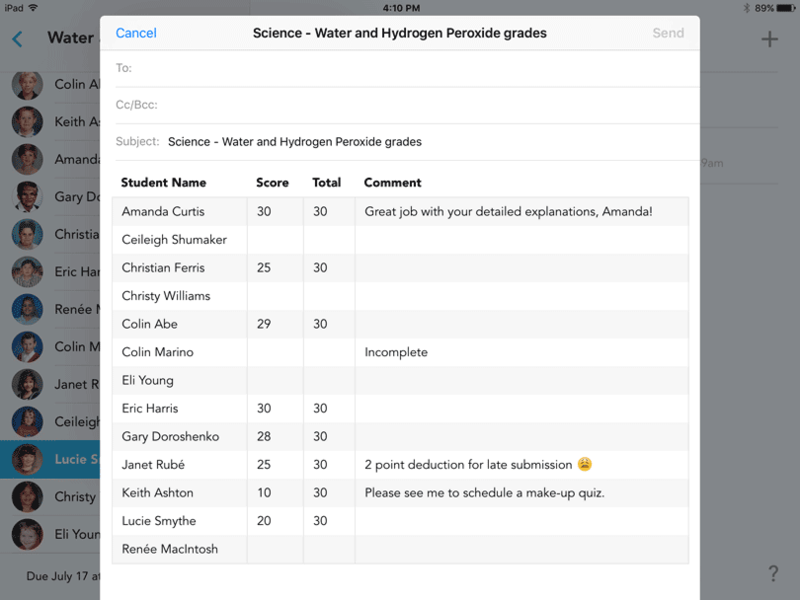 Grades in Showbie consist of a Score, a Total, and a Comment. All of these elements are optional and can contain any type of value, making them very flexible. A+, 100%, 10/10, “Great Work!”, and ???? 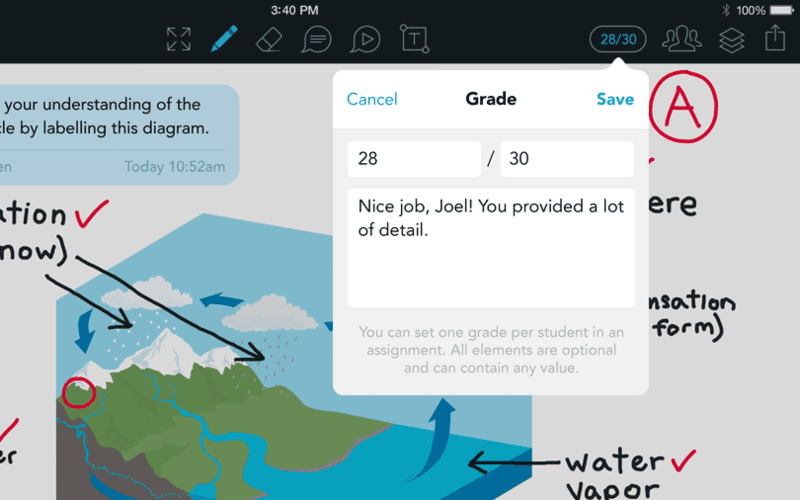 are all examples of grades that can be added to Showbie. If you’re adding scores with totals (e.g. 10/10), Showbie will remember the last total you entered to save you grading time, while allowing you to override the total for individual submissions if necessary. Grades appear chronologically in the assignment folder, so you and your students have a record of when the grade was added, and whether your student has added anything since the grade was posted. Grades can be revised, and your students will receive a notification when you’ve added or revised their grade. In the student list, you’ll see a summary of grades for the assignment, with the grade listed beside each student’s name. If the grade consists of a comment but no score, you’ll see a “…” icon indicating a comment-only grade. For students, grades are included as indicators on their assignment list, so they can see all the grades they’ve received for assignments in your class. Grades can also be reviewed by teachers in the new Student Search tab and by both teachers and students in the new All Assignments view. I’ll discuss these features later in this post. You can export grades as a CSV or HTML file from the Assignment Settings view of any assignment. CSV is perfect for importing into another system, such as your school’s LMS. The HTML option provides a nicely formatted table that’s good for printing or sharing with colleagues. If you choose ‘Send an Email’ from the export options, you’ll get a formatted grade table in the body of the email, plus the CSV as an attachment. Gradebook is included in Showbie Pro. Learn more about Pro on our plans page, or get a free upgrade by inviting a friend to use Showbie! 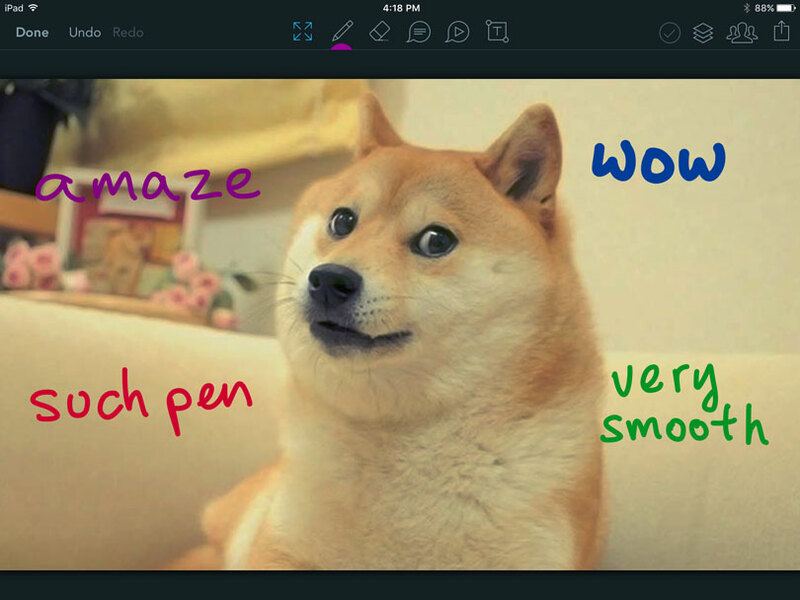 If you’ve done a lot of marking with Showbie, you know the pain of having to switch between the navigation tool and the pen tool while looking through student work and providing feedback. To alleviate this, we’ve added the ability to use multi-touch gestures with the pen tool selected. Now you can use two fingers to zoom in and out and pan around the page without having to constantly toggle between tools. Additionally, through the use of some very complicated math formulas (that I personally don’t claim to fully understand), we’ve upgraded the pen tool so that it generates much smoother and more natural-feeling lines. One internal tester stated that it felt like their stylus had been replaced with a stick of butter – so yeah, we think it’s pretty smooth. Try it out and let us know if you agree! The improved pen tool is included in both the Free and Pro versions of Showbie. Over the past year, many teachers have asked us for a ‘student-centric view’ where they can easily focus in on the classes, assignments, and work of one student – instead of having to hunt for that student within the main class/assignment structure of Showbie. 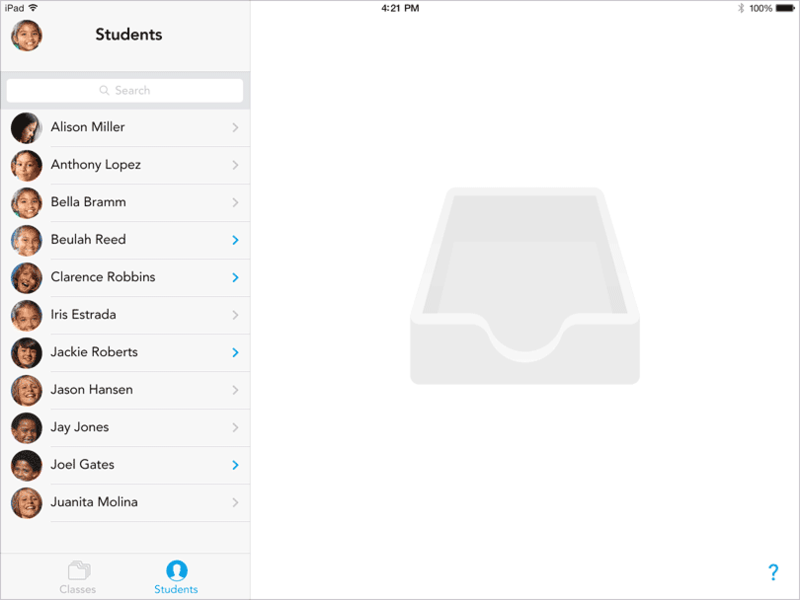 So in Showbie 2.2, we’re introducing the Students tab. In addition to the primary class/assignment/student structure (still accessible via the Classes tab), teachers can now switch to the Students tab to access all of their classwork grouped by student. The search field at the top of the student list makes it easy to locate a particular student if you use Showbie across several classes. Once you find the student you’re looking for, you can choose them from the list to view all of their classes, assignments and grades in one place. Student search is included in both the Free and Pro versions of Showbie. 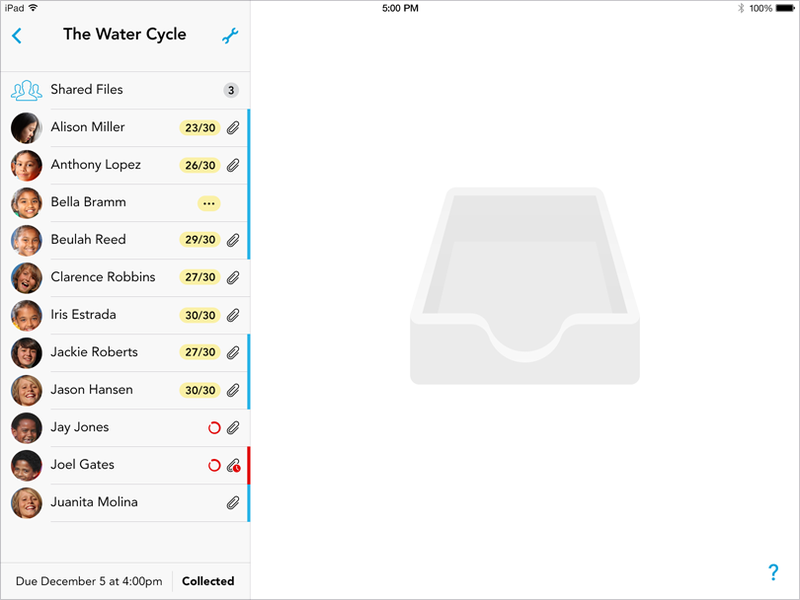 In Showbie 2.2, we’re making it easier for students to stay on top of their assignments and due dates. 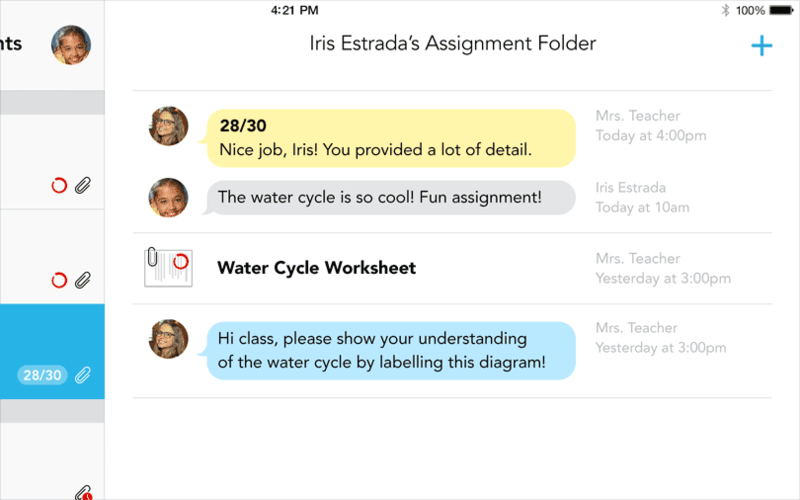 We noticed that as more teachers at a school start using Showbie, students enroll in more and more Showbie classes, and hunting through each class to figure out what’s assigned and what’s due becomes increasingly difficult. To address this, we’ve added the ‘All Assignments’ view. Now instead of selecting a class to view, students have the option of choosing ‘All Assignments’ in their class list, which will display a list of assignments from across all of their classes. Since the list is sorted by due date, it’s easy for students to see their upcoming workload at a glance. As a teacher, you can view your own All Assignments list under the Classes tab. Additionally, you can view the All Assignments list for any one of your students under the new Students tab. Remember that any grades you add to your gradebook will appear in all of these locations. We hope that these new features together will make Showbie even more flexible and useful for you and your students! 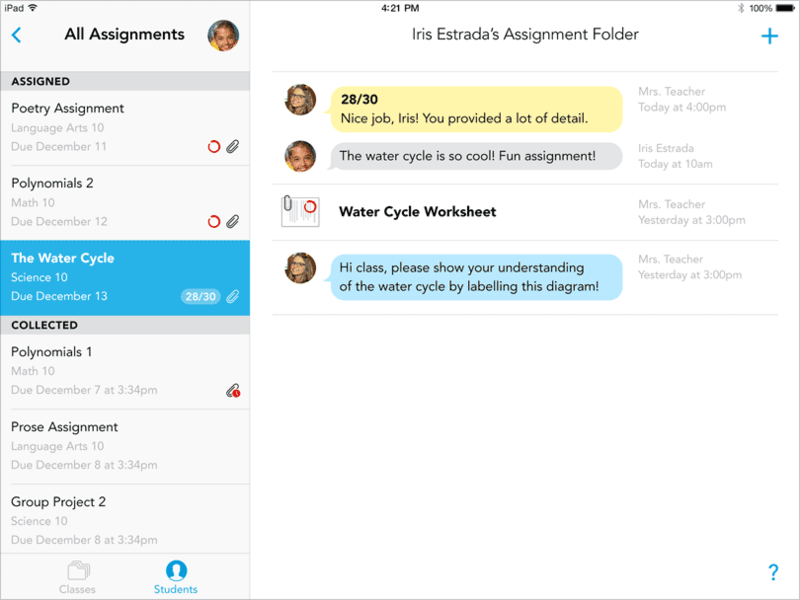 The All Assignments view is included in both the Free and Pro versions of Showbie. Well, that’s about it for now. We’ve got more big updates coming this fall, so check back here or follow us on Twitter for all the latest. Enjoy the rest of your summer and good luck in the new school year! Win One Year of Showbie Pro at iTeach 1:1!